Playing along with this week's CAS challenge at Splitcoaststampers: create a CAS card with a non-white background. I already had the background made from a stencil I cut with a Cricut file, colored using Tim Holtz distress oxide ink in cracked pistachio. My new hummingbird stamp from Penny Black just had to be done in watercolors, I felt, and since this was a CAS card, I stamped it directly onto the background rather than create another layer. Well, that didn't work out so well. 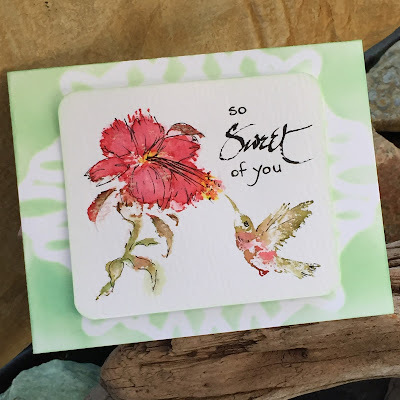 The watercolors (Stampin Up! rose red and wild wasabi) were too transparent; the stencil lines showed through. So I made another background but this time put the inks directly to the stamp, sprayed it lightly with water, and stamped it onto 140# watercolor paper. I did a little hand-painting with water, a little pen-and-ink detail, and hand-lettered the sentiment. Finally, I added just a touch of shimmer on the flower petals and hummingbird wings.